One was having a terrible day. She still couldn’t count to Nine, and the other numbers wouldn’t even let her try. 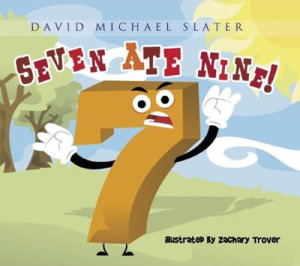 But things took a turn for the worse when Seven ate Nine. He was doing a real number on everyone! Will she be the last One left? When my nephew brought me this book and told me I would laugh, I was skeptical (after all, 4 year old humor and adult humor usually do not equate), but I began to read. Boy was I shocked. From the very first page I was smiling as One began to count (“Me, Two, Three…”). The smile only got bigger as I turned every page. The author, with a very unique view on the world of numbers, took something as simple as counting and made it into a hilarious tale. It was funny and entertaining and my nephew and I did laugh out loud. I especially liked how the author included comprehension questions at the end of the book (a true teacher at heart). Overall, a great, educational read. I picked up this book based on the title alone. I thought it would be a book my husband (an engineer with a quirky sense of humor) would enjoy reading to our kids (6 and 3.5). What an absolutely fun read!! My 3.5 year enjoys the numbers, the story and the great illustrations. I was surprised that my […] kindergartner actually understood the double meanings in the story (there’s more than ate/eight). We were all laughing as we read the book. I could see older kids enjoying this book quite a bit too. It’s a clever story that makes you laugh and has plenty of depth to the story to sink your minds in to. 789 is a good story for kids who have learned or are learning their numbers, and it is filled with puns that will charm adults and children. The story is about understanding and being one’s self, but it is not preachy and saccharine. The message is presented with warmth and humor, and can be fruitfully read a number of times.